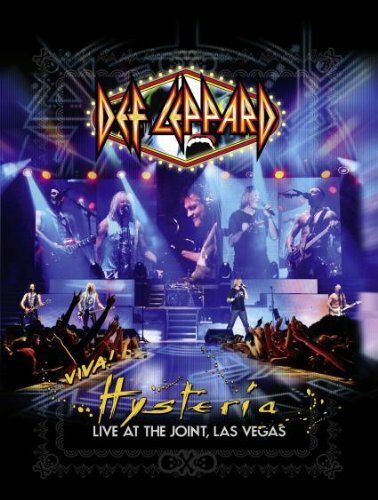 For the first time ever, Def Leppard played their album HYSTERIA in its entirety during an eleven-show residency which started on March 22, 2013 at The Joint in the Hard Rock Hotel And Casino in Las Vegas. The band also opened for themselves under the fictitious name of DED FLATBIRD for two different sets on each of the nights. During those DED FLATBIRD sets, the band showcased some fan favorites and rare songs from the early years of the band in addition to playing a selection of their greatest hits, highlighting classic material from throughout their career. The VIVA! HYSTERIA show featured an elaborate set design created specifically for Def Leppard ‘s Las Vegas residency. Known for legendary big-scale arena shows, Def Leppard will bring their over-the-top production to your house as VIVA! HYSTERIA is their first full live show shot in HD to be released commercially. VIVA! HYSTERIA showcases for the first time the band’s career-defining album performed live in its entirety – from start to finish – for a commercial audio/video release. DVD also includes bonus content of the acoustic medley: Where does love go when it dies/Now/When Love & Hate Collide/Have You Ever Needed Someone So Bad/Two Steps Behind. Lots more links on the right - try a few.